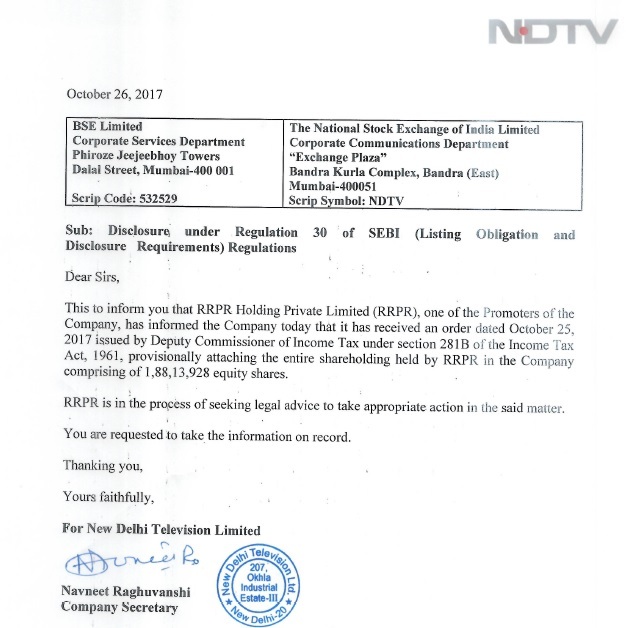 In yet another move on NDTV’s promoters Prannoy and Radhika Roy, the Income Tax Department today provisionally attaching the entire shareholding of RRPR Holding Private Limited (RRPR), in NDTV. RRPR is one of the promoters of NTDV the media house. RRPR is in turn owned by Prannoy and Radhika Roy. The intimation also states that RRPR is in the process of seeking legal advice in the matter. Section 281B of the Income Tax Act, authorises an officer to provisionally attach property of an assessee, if he is of the opinion that for the purpose of protecting the interests of the IT Department, it is necessary so to do. This is applicable in cases of assessment or reassessment of any income which has escaped assessment. NDTV’s shares were recently the subject of rumours when it was noticed by many that the share prices had moved up almost by almost 80% in just a few days, without any specific public reason. This attachment of property comes just months after the house of NDTV’s founders Prannoy and Radhika Roy was raided by the CBI. The raid was part a crackdown for bank frauds. The CBI has registered a case against Prannoy Roy, his wife and co-founder of the channel Radhika Roy, a private company and others for allegedly defrauding a private bank. The case related to a Rs 396 crore fraud on ICICI Bank. The Income Tax too was interested in these web of companies as it was looking into undisclosed income to the tune of Rs 1600 crore relating to NDTV. A media report, quoting sources, suggested that the assessment of the concealed income of Rs 642.5 crore by NDTV Group and related companies was done in February, 2014. Re-assessment proceedings for concealment of income of Rs 403.85 crore were initiated against M/s RRPR Holdings Pvt Ltd owned by Prannoy and Radhika Roy. NDTV itself had also been in trouble after, Sanjay Dutt, director of a financial-services firm Quantum Securities who owned around 125,000 shares in NDTV, had filed complaints with Enforcement Directorate and Directorate General of Income Tax alleging that that NDTV and its promoters had violated a number of laws. In January 2015, Dutt had filed a writ petition in Delhi High Court against Enforcement Directorate and Directorate General of Income Tax Investigation alleging that both agencies failed to act on his complaints. The Enforcement Directorate, in November last year, had slapped a show cause notice to NDTV for flouting foreign exchange regulations while bringing foreign investments to the tune of Rs 2,030 crore between 2007-10. The last time NDTV’s founders had to answer to the law, the media had taken a stand that this was against freedom of the press and the raids on the Roys were an attempt to silence media.